Rediscover the original exotic spices: Cracked Pepper and Sea Salt. Each has historically been used as a form of currency. 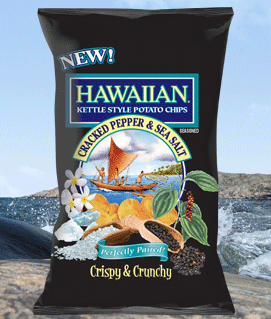 And here they are, Perfectly Paired, on our deliciously thick and crispy Hawaiian Kettle Style Potato Chips. Find the perfect wave on the perfect beach and you’ve got an idea how the best of simple things can make each other better. Mai e ‘ai! Take a taste of this re-discovered tropical treat. The unique blend of Jalapeño and White Cheddar compliments the already perfect snack food. Grab a bag of our Natural goodness and ENJOY! I prefer the chips to the popcorn. I don’t like my popcorn flavored. Of course these products would be much better if made from organic ingredients. I am also wary of anything that says “natural flavorings, as the popcorn does, in its ingredient list.